This is NOT my mom, but this is how she looks when she’s reading! My mom just FLEW through Debbie Macomber’s new book, called ‘Rose Harbor in Bloom’. Mom tends to power through any book if she finds it engaging. She can read cover to cover in a matter of hours, or days, as she did the hefty book about Steve Jobs. She’s been reading book after book on her iPad, which I purchased for her about two years ago. I loaded the Kindle app on there and then set it up using my own Kindle account, so anything I read she can read too. (I didn’t set up her own Kindle account because she watches her pennies and feels indulgent purchasing a book). Now, using Amazon, I can purchase and download any book she’d like to read, whether it appeals to me or not, and it appears on her iPad within minutes. Which is how the book by Debbie Macomber materialized. 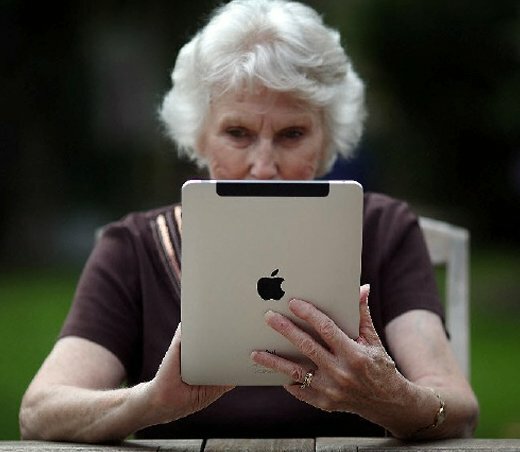 At almost 91, she has been managing the world of the iPad quite well over all. Every now and then, she calls asking me for some Genius Bar assistance. Even though I myself don’t own an iPad, as a rule I am able to help her out by phone, but occasionally it has to wait until I can hop a plane for the 4.5 hour flight that will take me to her place of residence. Although Debbie Macomber is dyslexic and has only a high school education, she was determined to be a writer. A stay-at-home mother raising four small children, Macomber nonetheless found the time to sit in her kitchen in front of a rented typewriter and work on developing her first few manuscripts. For five years she continued to write despite many rejections from publishers, finally turning to freelance magazine work to help her family make ends meet. With money that she saved from her freelance articles, Macomber attended a romance writer’s conference, where one of her manuscripts was selected to be publicly critiqued by an editor from Harlequin Enterprises Ltd. The editor tore apart her novel and recommended that she throw it away. Undaunted, Macomber scraped together $10 to mail the same novel, Heartsong, to Harlequin’s rival, Silhouette Books. Silhouette bought the book, which became the first romance novel to be reviewed by Publishers Weekly. I’m not a reader of the romance genre, so although her name sounded very familiar to me when Mom mentioned it, now I realize it was only because I’ve seen her paperbacks in every book store, grocery store and airport hub for decades. Turns out, there’s over 170 million copies of her books in print, and her titles have spawned four made-for-tv movies. What really caught my eye in her bio was the determination to persevere EVEN in light of the fact that an editor from a highly respected publishing house trashed her work at the very early stages of her writing journey. Now let me tell you…romance novels are the LAST thing my mother would be reading now (or EVER). ‘Rose Harbor In Bloom’ has been categorized to the ‘contemporary women’s fiction’ genre, and if my mom says it’s a great read, I’ll be reading it next (just as soon as I finish the lengthy book about Steve Jobs). Macomber is a three-time winner of the B. Dalton Award, and the inaugural winner of the fan-voted Quill Award for romance (2005, for 44 Cranberry Point). She has been awarded the Romantic Times Magazine Distinguished Lifetime Achievement Award and has won a Romance Writers of America RITA Award, the romance novelist’s equivalent of an Academy Award, for The Christmas Basket. Her novels have regularly appeared on the Waldenbooks and USAToday bestseller lists and have also earned spots on the New York Times Bestseller List. On September 6, 2007 she made Harlequin Enterprises history, by pulling off the rarest of triple plays—having her new novel, 74 Seaside Avenue, appear at the #1 position for paperback fiction on the New York Times, USAToday and Publishers Weekly bestseller lists. These three highly respected bestseller lists are considered the bellwethers for a book’s performance in the United States. Isn’t it nice to know that the success of a writer doesn’t lie within the opinion of an editor…even one from a highly regarded publishing house? It seems to me that the success lies within the effort put into the journey. Perseverance, thick skin, and having the determination to NOT look back unless you’re going that way. Those are the surely the cornerstones of success, don’t you think? ← Miley, are you SERIOUSLY interested to become the poster child for ‘twerking’?!? Hi Ann! I was inspired by your comment on my She Writes post and am so glad to have read this. We should get Debbie Macomber to do a post for She Writes, don’t you think? Hi Kamy…Great idea! I think Debbie should be the ‘poster girl’ for perseverance in the face of rejection. She’s a real inspiration. Thanks for taking the time to stop by and read my blog. I’m still getting acquainted with She Writes and really enjoying the email updates that you send out. There’s just so much to navigate for tentative newbies like me. Great idea! At the beginning of your post, I had no idea what my word would be. By the end, I know for sure what it sholud be. PATIENCE. I need to be more patient with my kids, my husband, my friends and myself. I also need to be more patient in my writing. (Oh, I and I definitely need to be more patient with other drivers too.) Patience is something I’ve struggled with my whole life, and I am not confident in my ability to become more patient and stay that way. This is why I’m committing to pray about patience every day too. I need to inundate myself with the concept of patience. Thank you for this post. I wanted to do something different to work on patience, and maybe this is they key I needed. Thank you for taking the time to comment on my post. We all have things we can work on and you are certainly not alone in wishing for greater patience! Awareness is probably the first step towards changing, I think. Good luck with your writing!